The presence of a mediastinal hyperfunctioning parathyroid gland is a rare condition that occurs in about 1% to 2% of cases. We present our experience with video-endoscopic parathyroidectomy and a review of the literature. In seven patients (four male, three female; age 28–67 years) mediastinal hyperfunctioning parathyroid glands were removed by the thoracoscopic route (VATS). Six patients suffered from primary hyperpathyroidism and one woman from recurrent secondary hyperparathyroidism. Additionally, articles concerning endoscopic treatment of mediastinal parathyroid glands were collected from the medical databases. A total of 58 patients were found in the English and French literature. Neither intraoperative nor postoperative complications occurred in our patients. Operating time was 90 minutes (range 40–180 minutes). After a mean follow-up of 29 ± 12 months (range 3–64), all patients are biochemically cured. The cases in the literature showed healing in 57 of 58 cases. Their mean operating time was 112 minutes (range 40–240 minutes). One perioperative death due to myocardial infarction and a major complications rate of 7% are described. 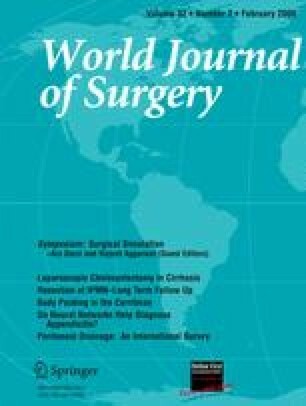 The thoracoscopic approach to mediastinal parathyroidectomy is a safe, feasible technique with a low complication rate and good cosmetic outcome. It should become the standard surgical access for mediastinal hyperfunctioning parathyroid glands.